Use low-cost employee motivation to help your employees to have an emotional ownership in the success of your enterprise. Any time, especially in difficult economic times, throwing money with a strategy-less approach, at this challenge is generally not your best bet. However, putting energy and strategy into helping your employees will always serve you well. You can easily make employees your “Partners” in success, with just a little effort. What business can honestly state that they have no employee challenges? Every business leader must excel at low-cost employee motivation for his or her employees. Through my two decades of research on this topic, I firmly believe that recognition is your Number One key to success. And, the best part is that you can do so much to enable this effort at little or no cost to your organization. 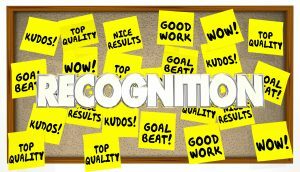 Below, you’ll find several no cost and low cost employee recognition ideas that I’ve culled from my years of work in this area. Embrace a newly energized for low-cost employee motivation effort to show your employees through both word and deed that they matter to you and your organization. Give them a modicum of respect and appreciation, and you’ll be amazed how they respond. To start, how about a desk or workstation visit from the president? What’s that cost? Nothing. And yet the value is priceless. Are you getting the idea? Birthday card mailed to employee’s home. Afternoon Birthday celebration with cake and coffee. Notice to all employees of an employee’s special performance. Letter of recognition in employee’s permanent file. Have a “Highlighting Employee” section in company newsletter. Paid time off (big in the military). Flowers from manager’s home garden. Company T-shirt, polo shirt, denim shirt, cap, of jacket. Private lunch with the president or other executive. Gift certificates to local restaurant, theater or video rental store. Private verbal praise, especially in the presence of co-workers. An office Pass-on button that states, “Job well Done!” or “Special Effort”. Bake cookies for an employee. Selecting the workplace radio station for a week. “Come in late/get off early” card. Get the workplace recycled soda cans for a month. Handshake and a sincere, “Thank you”. Specialty advertising items with company logo. Care package to spouse or children of employee. Letter about employee’s accomplishments to their family. Food: all-day suckers, pizza, donuts or maybe even something healthy. “Get Out of Meeting” card. Free vending machine privileges for the week. Cater breakfast at employee’s desk. Party at owner or executive’s home. “We’ll do it Your Way Today” card. Software, special keyboard, new chair, etc. Notice about employee accomplishments in local newspaper. Lunch or dinner at long meetings and training classes. Personal encouragement and mentoring from anyone in the executive suite. Allowed to attend a business or personal skills seminar of their choice. Specialty area diploma for employee, signed by department head and division executive or president. Allowing the staff member to sit in or chair the monthly management meeting. An afternoon off for shopping etc. Recognition at regular staff breakfasts, verbally and by acclamation. A CD/DVD record of the project or job, which led to the outstanding behavior. Notice about employee accomplishments in company’s web site or newsletter. Make your employee look good in front of his/her spouse/significant other; you’ll have won a large amount of loyalty. I bet you could come up with a dozen more low-cost employee motivation ideas if you just put some thought into it. The important factor to grasp is that it is less about the material recognition and more about the bragging rights and emotional connection that an employee receives from being singled out for a job well done. Now please, go onward and spread the emotional wealth.